Hooray for Fridays. Hope you have a wonderful weekend. Love the subtle stamping! This is sssooooo pretty! Great card Lucy! Love the tone on tone. Happy Weekend! So pretty, Lucy! Love the tone-on-tone stamping! Thanks for the heads up at 2Ps! Have a great weekend, too! 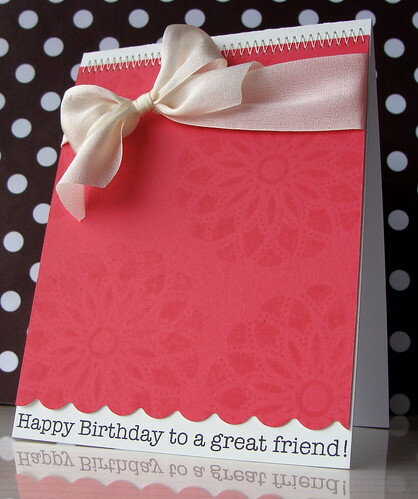 A little stamping can do SO much...Love this, Lucy! I have to be on the hunt for the layering pp and chalk ink! Just beautiful Lucy. That Punch colour is just delish!!! And your card design is super. Very pretty with the chalk and paper hues! I love them and can't get enough of them! Gorgeous bowtie! Lovely, so simple but so very elegant. Thank you. I like these plain elegant cards. Very nice! what a beautiful blog!!! your works are amazing!! I just loved reading your blog. Thank you for letting me visit.